Born in Carthage, Missouri in 1952. Dan and his wife, Joann, a high school counselor, live in suburban Dallas, Texas, where they raised their three children. A career in art seemed pretty far-fetched for a kid attending elementary grades in a rural Missouri, two-room school house where an otherwise, wonderful teacher kept him from recess for wasting time drawing when he should have been doing something more productive. The opportunities for exploring the world of art were fairly limited but his parents saw some hint of talent and did what they could do to find ways to nurture and develop his interest in art. Sometimes that meant driving many miles to a Saturday morning art class in a neighboring town but it always meant words of praise and encouragement to continue and to improve. It would not be until later that he would realize that the rustic but proud old barns and out-buildings and the rolling sweat soaked fields and pastures that he grew up with would be the inspiration for much of the art that he would produce and that he still enjoys doing. In high school he was blessed to have an enthusiastic, young art teacher whose own joy and passion for art would open the door to Dan’s pursuit of a career in some part of the art world. He majored in art in college aiming for a teaching degree but a small architectural firm gave him a part-time job doing their architectural renderings and by the time of his college graduation he had developed a keen interest in and fair aptitude for architectural illustration. So rather than looking for a job as an art teacher he packed up his little family and moved to Dallas, Texas, going to work in an established illustration firm there. In Dallas, Dan was surrounded by some incredibly talented young artists that were willing to share their techniques and procedures and helped him develop his own skill as an architectural illustrator. They remain his friends and continue to inspire him. Over the years he’s had the opportunity to work with some of the finest architects and interior designers from around the world and in this new age of computer-generated illustration he continues to provide his clients with high quality hand-made renderings. His interest in golf led Dan to try his hand at golf landscapes and many of his paintings are now in private and corporate collections. 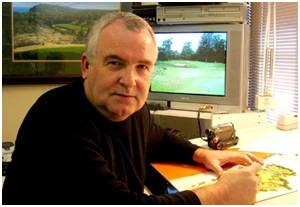 He has had a long relationship with Great Golf Resorts of the World, a Pennsylvania publishing company, and continues producing art work for their various publications. Dan’s interests are revealed in his other art work: history, architecture, aviation, old cars, fine cigars, and his family. Thanks for your visit and your interest in Dan Wardlow’s art.